Teachers carry out regular assessments of children’s progress by scrutinising their schoolwork and testing their understanding of what has been taught. Key Stage Two is taught in Years 3 to 6 (ages 7 to 11 years) in the Juniors. Statutory assessments of progress are carried out at the end of each Key Stage. They consist of a teacher assessment, based on the evidence of the child’s achievements in lessons, and a Standardised Assessment (SAT) based on the child’s score in specific tests or tasks. Children’s progress with the National Curriculum is measured using numbered levels. The Early Years Foundation Stage and profile is completed during these years. Most children at the end of Key Stage 1 (7 year olds) are expected to achieve level 2, and children at the end of Key Stage 2 (11 year olds) are expected to achieve level 4. Children who enter the school in the reception class often bring their Foundation Stage profile with them from their nursery or other pre-school provider. 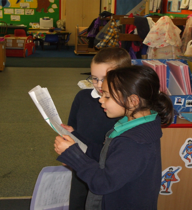 Children are assessed regularly in all areas of the Foundation Curriculum. Summary Foundation Stage profiles are completed 4 weeks before the end of the summer term.